The education survey of Cleveland was undertaken in April, 1915, at the invitation of the Cleveland Board of Education and the Survey Committee of the Cleveland Foundation, and continued until June, 1916. 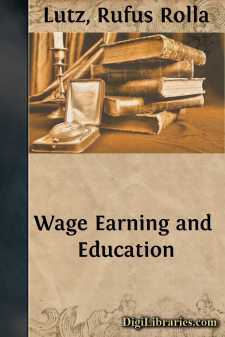 As a part of the work detailed studies were made of the leading industries of the city for the purpose of determining what measures should be taken by the public school system to prepare young people for wage-earning occupations and to provide supplementary trade instruction for those already in employment. The studies also dealt with all forms of vocational education conducted at that time under public school auspices. Separate studies were made of the metal industry, building and construction, printing and publishing, railroad and street transportation, clothing manufacture, department store work, and clerical occupations. The wage-earners in these fields of employment constitute nearly 60 per cent of the total number of persons engaged in gainful occupations and include 95 per cent of the skilled workmen in the city. The survey also gave considerable attention to the various types of semi-skilled work found in the principal industries. Each separate study was assigned to a particular member of the Survey Staff who personally carried on the field investigations and later submitted a report to the director of the survey. Each report was also subjected to careful analysis and criticism from other members of the Survey Staff before it was finally passed upon by the Survey Committee. Mimeographed copies were sent to representatives of the industry and to the superintendent of schools and members of the school board and their criticisms and suggestions were given careful consideration before the Committee and the director of the survey gave their final approval to the publication of the report. The value of the work was greatly enhanced through the ample discussion of the different studies from widely diverse points of view secured in this way. The industrial studies were carried through under the direction of the author of this summary volume. "Boys and Girls in Commercial Work"—Bertha M. Stevens; teacher in elementary and secondary schools; agent of Associated Charities; secretary of Consumers' League of Ohio; director of Girls' Bureau of Cleveland; author of "Women's Work in Cleveland"; co-author of "Commercial Work and Training for Girls."